Fun Facts about the Flame of Hope! This week, I’ve spent a lot of time learning everything there is to know about the Flame of Hope, and I finally finished the Wikipedia article I’ve been creating for it! 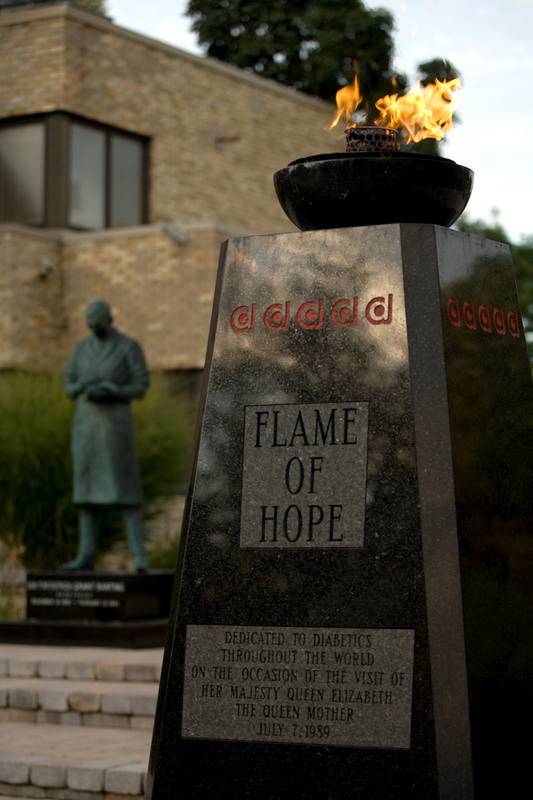 What I usually tell people on my tours is that the Flame of Hope honours all those affected by diabetes and stands as a symbol of hope for a cure to be discovered. It was kindled by the Queen Mother in 1989, and will only be extinguished when a cure is found, by the team that discovered it. That’s just the most important information though – the tip of the iceberg. From how it was actually installed, to events that use it as their symbol, to all the things it’s been in the news for, there are a lot of interesting facts about the Flame of Hope. I think my favourite fact is that the monument was lowered onto its resting place with ice cubes. After reading that in a newspaper article from 1989, it took me a few minutes to realize – that means it was actually set on ice cubes, and as they melted underneath it, it was slowly lowered to the ground; sounds ingenious and effective, to me! The monument is made of onyx granite, but the interesting part is, it’s acid-rain-proof. The Flame can also withstand at least 17 kilometre-an-hour wind, rain, and snow – very Canadian, right? If you want to know more, there’s plenty of information in the new Wikipedia article! You can also check out Banting House NHSC, Banting’s Crater, or Sir Frederick Banting himself (my next review)! Posted in Behind the Scenes at Banting House.Tagged Banting House NHSC, Flame of Hope, Interesting Facts, research, Sir Frederick G. Banting Square, Wikipedia.